At least, prophecies played straight. So it came as a great relief to me for someone to finally one-up destiny in The Stormcaller - in possibly the best moment of the book! 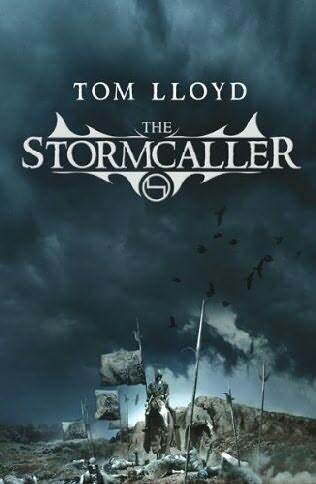 This is, I admit, a reread - I first read The Stormcaller a while back, but completely forgot its existence, and with the sequels now released, I think it's time for me to pick it up again. So here goes, my review. Isak, our protagonist, is a white-eye: a breed of human made more powerful, charismatic, and quick-tempered by the Gods. He is rapidly elevated from a lowly position (when isn't it?) to the Krann, or heir, to the reigning Lord of the Farlan by their patron God, Nartis - but it soon becomes clear that there's more than Nartis working to manipulate Isak. As he attempts to accustom himself to his new position in court - Isak is remarkably impolitic, and this is probably his most unlikable stage, because Isak is hardly an unquestionably sympathetic protagonist - he is marked by more than his patron God: the newly met attempt his death, his gifts from the Gods are the weapons and armour of their betrayer (the last Elven King), and he dreams of Lord Bahl's death every night. Luckily, Isak isn't the 'special' character of many fantasy novels: an author's darling able to do no wrong. Isak is impolitic, and his development into the new role makes him both more realistic and sympathetic. Far from being blessed by prophecy, it's more often a curse - and Isak is determined to escape this 'destiny'. However, he doesn't exist in a vacuum: the other members of the trio are likewise well-crafted. Tila and Count Vesna make an excellent (and at times amusing pair), and Lloyd manages to let her escape being a romantic interest for Isak. Altogether, The Stormcaller is a good start to a series, which doesn't quite cross the line into 'great': needing either more scope/complexity or character development to get there. Nevertheless, its success shows that its sequels might well get there, and Lloyd deserves a lot of credit for questioning and playing with accepted elements! Comments, questions, or criticisms? Comment below and tell me your thoughts!